Hugh is a current PhD student at the University of Leeds, UK, working under the primary supervision of Dr Rob Chapman and Dr Dan Morgan. 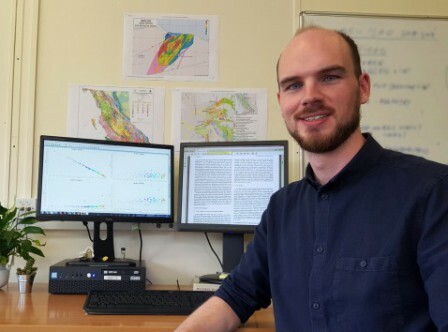 He received an integrated master's degree in geology (MGeol) from the University of Leicester (UK) in 2016, with his master's research project investigating the formation of a gold-rich volcanogenic massive sulphide deposit in Ethiopia. His enjoyment for research in economic geology led to a research associate position (also at Leicester), where he worked on a project exploring the application of deep eutectic solvent ionic liquids for precious metal recovery from ores and concentrates. This position encouraged him to pursue ore deposits research at a PhD level. His current research interests include the geochemistry of mineralizing fluids, the behaviour of precious metals and critical elements in magmatic-hydrothermal systems, and the evolution of gold-bearing ore deposits. Project: The evolution of porphyry-epithermal gold systems using trace element mobility and concentration: Insights from the Iron Cap deposit, Kerr-Sulphurets-Mitchell district, northwest British Columbia. Porphyry- and epithermal-style deposits are often spatially, temporally and genetically linked. They are associated with subduction-induced magmatism at convergent tectonic margins, and frequently host significant quantities of gold, copper, molybdenum and silver. The magmatic-hydrothermal systems that form the economically-viable deposits are complex, from an initial intrusive stage, through syn-mineralization hydrothermal fluid activity, to post-mineralization fluid flow. As such, there remain significant gaps in understanding of how these systems evolve, particularly in the periods of, and between, ore genesis. This study aims to elucidate the physico-chemical conditions of the hydrothermal fluids that facilitate ore deposition in certain parts of an evolving magmatic-hydrothermal system. The Iron Cap deposit, in the Kerr-Sulphurets-Mitchell (KSM) district, provides an excellent opportunity to investigate porphyry-epithermal evolution. The KSM district as a whole hosts 38.8 Moz Au and 10.2 Mlb of copper (measured in reserves), within predominantly porphyry-style deposits. To understand the magmatic-hydrothermal evolution, Iron Cap will be studied in terms of its trace elements, including gold. Analysing the mobility, speciation and partitioning of trace elements at different points within the system will point toward changes in the physico-chemical conditions of the hydrothermal fluids. One specialization of the research at the University of Leeds is the study of the compositional variation of natural gold. The gold is characterized by measuring concentrations of minor alloying elements (Ag, Hg, Pd, Cu) and by systematic recording of mineral inclusions revealed in polished section. Study of alloy compositions and mineral inclusion suites will allow characterization of natural gold in the KSM district, in addition to providing an independent avenue to speculate the prevailing fluid conditions during ore genesis. The overall aim of this project is to define the physico-chemical conditions at various points within the Iron Cap deposit and to develop a detailed model describing the evolving hydrothermal process. The location-specific outcomes will subsequently be evaluated to inform a wider understanding of the evolution of porphyry-epithermal mineralizing systems.